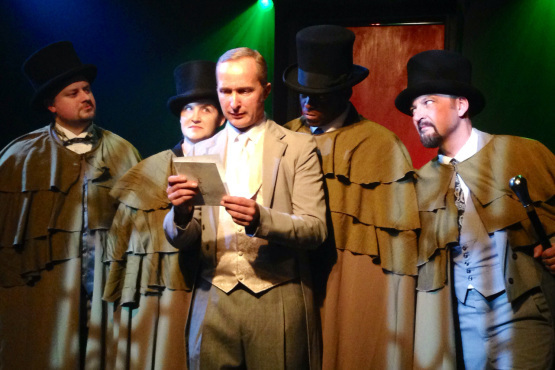 Idle Muse Theatre Company presents DR. JEKYLL AND MR. HYDE. The well-known tale of physician-by-day and killer-by-night gets an intellectual makeover in Playwright Jeffrey Hatcher’s adaptation. Hatcher has one Jekyll and several Hydes. Each ensemble member plays one of Jekyll’s various colleagues but they also each play his mental nemeses, Hyde. The notion is clever. And under Nathan Pease’s skillful direction, the execution is unforgettably disturbing. This isn’t a slasher play about a deformed Freddie, Michael or Jason. It’s a true psychological killer. Instead of the naive teens in a blood-curdling movie, these prim and proper folks of Victorian England believe in reputation and integrity. Classism defines a person’s character. A doctor would never be considered a threat. Modern-day cynicism is suspended as the audience is pulled into this world of old-fashioned certainty of human nature. Pease anchors the play in sophisticated wordplay. The polite repartee has this ‘pardon- me-but-is-this-circumstantial-evidence-yours.‘ The apologetic accusations could come off buffoonish. Yet, Pease holds the reins tight. He constructs a world of civility interrupted by the presence of unpleasantness aka an elusive serial killer. It works perfectly. In particular, a very tucked Gary Barth (Jekyll) weaves his fabricated stories of explanation with plausible believability. I know the story and I’m almost convinced that he’s been wrongly accused. It’s Barth’s unexpected outbursts of rage that fortify that he is indeed a sociopath. And I become uncomfortable about the distance between stage and audience. The entire ensemble is terrific. They transition in and out of Hyde personas sometimes even within conversations. Their appearance in multitude, clad in matching cloaks and top hats by Costume Designer Erin Gallagher, is unsettling. We watch individually and collectively as they goad Barth into living out his dangerous impulses. There is a real ensemble at work here. So much so, actors meld together like a nightmare where the mind plays tricks and evil changes faces but it still is the same evil, still the same nightmare. It’s indistinguishably creepy. A door continually swirls across the stage to blur whether the character is going in and out of a room or in and out of the recesses of the mind. At one point, Pease orchestrates a visible transformation between Jekyll and Hyde. Barth and Julie Cowden are on the floor, eyes locked. They circle each other in an intense face off. Barth enters around the door as Cowden exits. Who is good? And who is evil? It is unclear. Hatcher’s script is thought-provoking. There are unexpected chilling confessions. Like when, Cowden, as the maid, admits she should have called the police sooner. Her delayed response is criminal. The play is riddled with characters subtly conceding their own bad deeds. The very last disclosure of the play (I won’t ruin it) has a profundity that might have marred me for life. DR. JEKYLL AND MR. HYDE isn’t a Halloween horror show. It’s much spookier than that. It illustrates the invisible monsters walking amongst us and within us the other 364 days of the year.